I've seen these things knocking around - riffing on the seventies(?) versions of "Car Fixing For Dummies" which, in theory, would allow anyone to fix their own car themselves with detailed instructions and diagrams. Nifty. I expected quite a dense book full of trivia aimed at the full-on fans to fit with the look and notion. Probably riffing on the seventies vibe since the Haynes manuals are contemporaries of the original trilogy. Detailed diagrams of the garbage compactors, for example, with a warning about potential tentaclely infestations and a footnote somewhere about a poorly shielded exhaust port... That kinda thing. The first clue that this isn't what I am going to get is the back cover blurb: "Conceived as the Empire's ultimate weapon, the Death Star battle station was equipped with..." ...sorry... "was"? Why do I need an owner's manual for something that isn't around any more... hmmm. Okay I am taking this way to seriously. The things promised sound pretty cool though: "In this manual, the Death Star's onboard systems and controls are explained in detail, and are illustrated with an astonishing range of computer-generated artwork, floor plans, cutaways, and exploded diagrams..."
I confess I may be a nerd of the filmic universe but have only sketchy knowledge of the extended world and so can't say if the all prose draws from them but it reads like it's been made up by a pair of sixteen year olds and a Star Wars Name Generator app. The book was written in 2013 and the decision to reissue it in 2016, just before Rogue One dropped, shows itself as a mere blatant cash in, because the runaway success of that filmic version of the Death Star's history and creation now renders vast swathes of this "definitive manual" incorrect (yes I know it's not real). There are lots of stills from the films and the line drawings are pretty neat but the whole thing feels a bit half-arsed. They try and fit in letters and journal entries but it just doesn't work. The whole thing is a bit of a mess and doesn't actually know what it's trying to be. 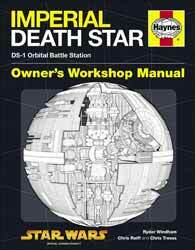 A guide to the Death Star for ten year olds maybe? The three guys involved clearly have the pedigree but if you dig the Haynes Manual iconography I bet you can just buy it on a t-shirt for the same as the £16.99 rrp.